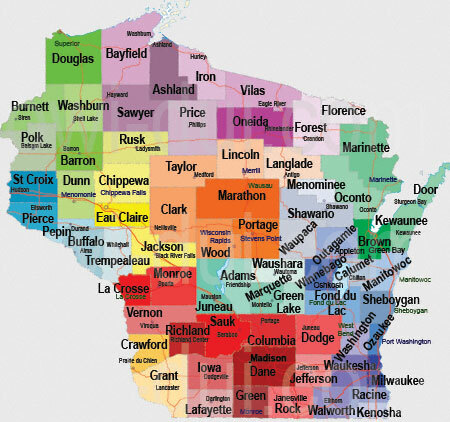 Wisconsin has 72 counties, all of which are displayed in the map above. Your ticket will indicate the county or municipality that has jurisdiction over your case. By clicking on the county in the map above, you can also see which attorneys regularly represent people in those jurisdictions. OWI-DUI.com represents Wisconsin's Best Drunk Driving Defense Attorneys. These DUI defense lawyers represent people across the state of Wisconsin who have been stopped, arrested and charged with drunk driving (called OWI in Wisconsin for Operating While Under The Influence) or related charges, such as refusing to submit to a test under Wisconsin's Implied Consent Laws. They will represent you during the administrative hearing, pretrial negotiations with the district attorney, plea bargaining, and the jury or bench trial. Many of the attorneys represented here participate in the OWI-DUI.com Discount Program which provides you with reduced fees when you hire an attorney that participates. All attorneys who participate in the discount program are represented on this site. To take advantage of the OWI-DUI.com Discount Program, just mention it when you contact us at 1-877-749-7858 or in your communication via the online form. You can also mention it to the firm when you hire them. These attorneys also offer a free initial consultation to people who are seeking to hire an attorney to represent them (or someone else for whom they are hiring an attorney). To take advantage of the free initial consultation, please contact an attorney by calling 1-877-749-7858 or using the online form to contact an attorney directly. If we can be of help, please call us at 1-877-749-7858, or use the online form to contact an attorney today. OWI-DUI.com is not advertising. Attorneys cannot buy their way onto this website or into the OWI-DUI.com program; rather, they must earn their way there. Some of these attorneys are Super Lawyers, some are listed to Madison's Best Lawyers and Milwaukee's Best Lawyers, and some are featured on various directories; however, none of those credentials matter here. The criteria that sets these attorneys apart from all the rest is their knowledge of, experience in, and success with defending drunk driving cases in Wisconsin. These attorneys are reviewed by their hardest critics - their peers - for their knowledge of Wisconsin's drunk driving laws, pre-trial preparation, and courtroom performance, as well as their ability to articulate that knowledge and experience where it matters most - in litigation. Their records with judges, prosecuting attorneys, and in past cases are regarded by Wisconsin lawyers as the benchmark to which all other attorneys measure their success. They have written the books on OWI laws in Wisconsin, taught at numerous drunk driving law seminars to educate other attorneys on how to bring the most effective defense cases against the toughest prosecuting attorneys on OWI and related charges, and been featured in news articles, magazines, on television and on the radio for their expert advice. Their experience is unparalleled. Wouldn't you rather have a highly qualified and extensively experienced attorney representing you? We would. The attorneys here must have no reservations towards referring a client to one another. That single most critical fact sets this site apart from any other. While no assurances of success can be given (the bar prohibits any such promises) and past results must be disclaimed so as not to reflect a promise of future performance, you can rest reassured by hiring one of these attorneys that they have been scrutinized by their peers, and they are regarded as the most qualified and experienced DUI defense lawyers in this state. The information at this website and on pages to which it may link is not nor is it intended to be legal advice, nor is it warranted for accuracy, timeliness or correctness. No person should ever make legal decisions based on general information; the law is not generalized, but specifically applied to all cases and the facts therein.